Continuing to fight those accusations of West Coast bias, even though no one has actually made any, let’s stay over in Edinburgh for another day shall we? This was meant to be posted Friday, but has slipped to Sunday. Just when I was becoming almost efficient too. It’ll be nice if my computer will behave long enough to let me get this posted. Here’s hoping. 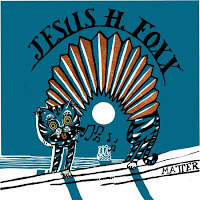 Jesus H. Foxx are seven piece from Edinburgh, with two drummer, three guitarists and as their bio puts it a partridge in a pear tree (a cornet player who sometimes plays glockenspiel) with a couple of releases to their name, the most recent of which, Matter, was released by Song, By Toad Records at the start of August. Matthew of the Song, By Toad blog & label was kind enough to send me over a copy to have a listen to. To be honest, I was completely surprised by what I heard. Between the name and the promise of multiple drummers and guitarists I expected something riff laden, mildly chaotic and quite aggressive, instead I got gentle instrumentation, tender vocals and very sweet harmonies. Gentle and mild, rather than chaotic and aggressive. Not at all what I expected then! Don’t get me wrong, I like myself some chaos and love a bit of riffage, but sometimes I like a nice surprise too. The songs on the Matter EP are a very nice surprise indeed. In fact, they are just all round very nice. I am however at a loss to explain what they sound like, I can’t think of any other bands to compare them too and “melodic and pleasant” doesn’t really help much. Instead of me trying to describe them, how about you go listen for yourself then? There’s songs on MySpace, and a download of one of the EP tracks, I’m Half The Man You Were, below. You can buy the new EP, Matter, here.